After the Philadelphia Eagles won their first Super Bowl title in Sunday’s game against the New England Patriots, all eyes turned to the city’s long-awaited celebratory parade. The parade, which will be held on Thursday, will travel through the heart of Center City, which includes the central business district and neighborhoods including Rittenhouse Square and Washington Square West. Over one million fans are expected to welcome their championship team back to the city and revel in a hard-fought victory. 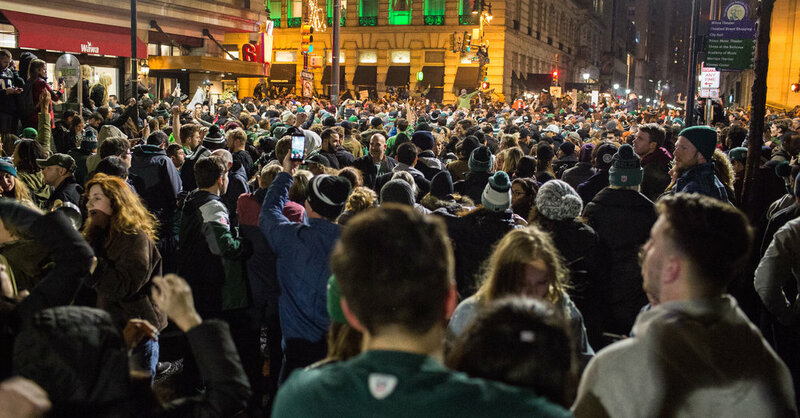 Here are some ways to navigate your trip to Philadelphia for the parade. The parade will begin at 11 a.m. at the intersection of Broad Street and Pattison Avenue in South Philadelphia, heading north through Center City and then shifting northwest along the iconic, tree-lined Benjamin Franklin Parkway to the Philadelphia Museum of Art. It will last for about two hours. There are plans for 14 Jumbotrons along the parade route, which will also be barricaded for the entire length. A formal celebration will begin at 1 p.m. in front of the museum, also lasting for roughly two hours. With more than 1.5 million residents, Philadelphia, the largest city in Pennsylvania, was home to some of the most pivotal historical events in American history, including the signing of the Declaration of Independence and the Second Continental Congress, and enjoys a scenic perch along the Delaware River. The city boasts an extensive road network, but driving into the city is strongly discouraged on Thursday, especially in Center City, as many roads will be closed and extensive parking restrictions will be enforced. Bicycle lanes along the Benjamin Franklin Parkway and Broad Street will be largely closed to the public. If you’re traveling into the city for the parade, the best option is to use public transportation. The Southeastern Pennsylvania Transportation Authority, or SEPTA, connects the city and surrounding Bucks, Chester, Delaware and Montgomery counties through a combination of subway, trolley, bus and train services. On Thursday, the SEPTA Market-Frankford and Broad Street rapid transit lines will both have free admission for all riders, and trains will run every 5 to 7 minutes beginning at 5 a.m., with additional service to accommodate the expected surge in ridership. Individual stations are subject to closure on Thursday if crowd sizes overwhelm surrounding streets. Other SEPTA services will continue to charge their regular fares. For fans from the Philadelphia suburbs and Delaware, SEPTA Regional Rail service will only operate inbound trains into the city on Thursday morning, with service becoming outbound-only after the parade is finished. Regional Rail service from Philadelphia will run from 2 p.m. until 9 p.m. Many stations will not be open, and Center City access via Regional Rail will be available at Jefferson Station and the 30th Street Station. Suburban Station will be closed on Thursday, along with the University City and Temple University stations. Only weekly, monthly and one-day passes will be accepted for Regional Rail service. Prepaid one-day Independence passes to access Regional Rail trains will cost $10 and are currently available for purchase. Cash fares will not be accepted on Thursday. Philadelphia’s 30th Street Station is one of the busiest stations on Amtrak’s Northeast Corridor, which runs from Boston to Washington. It also is a stop on the high-speed Acela Express service. The Amtrak Keystone Service is also available from Harrisburg, the state capital. Seats are still available on some Amtrak trains, but tickets are very limited. Before and after the parade, enjoy the restaurants and cultural amenities that have always given Philadelphia a charm that can’t be replicated. From John’s Roast Pork to the Institute of Contemporary Art, the city is ready for your visit. Philadelphia Eagles wide receiver Nelson Agholor holds the Vince Lombardi Trophy in Philadelphia.CreditJulio Cortez/Associated Press..
For parade updates, including new transit information, fans are encouraged to text ReadyEagles to 888-777, with alerts coming from the City of Philadelphia Office of Emergency Management.